The BJP government was the first, after Independence, to take forceful multi-pronged steps to develop northeast India, Prime Minister Narendra Modi said on Thursday. "To know the region better, the number of ministers and top officials visited the northeast region during the past three and a half years are much much higher than the number of ministers and top officials who visited during the Congress regime. The secretariat of the DoNER (Development of North Eastern Region) for the first time is being functioning in each of the eight states," he said in his address at rallies at Sonamura, around 50 km south-west of Agartala and Kailashahar, 155 km from the state capital.Noting that in 2022 India will complete 75 years of Independence while Tripura would observe the golden jubilee of full-fledged statehood, he said: "Hence the people of the state should carefully decide on whom to vote for in the assembly elections on February 18." "The modern and developed Tripura dreamed by the last Tripura king Bir Bikram Kishore Manikya has been destroyed by the Left parties and it is high time the people went for executing the 'Chalo Paltai' (Go for Change) programme at the grassroot level," he said, urging them to support his Bharatiya Janata Party. Modi also said that once the BJP comes to power, implementation of the recommendations of the 7th Pay Commission for employees would immediately start.He also laid stress on quality of education for students of Tripura and need for increased employment opportunities. "CPI-M keeps demanding answers from the Modi government in Delhi but here they should answer their own people as to what they have done over the past 25 years. 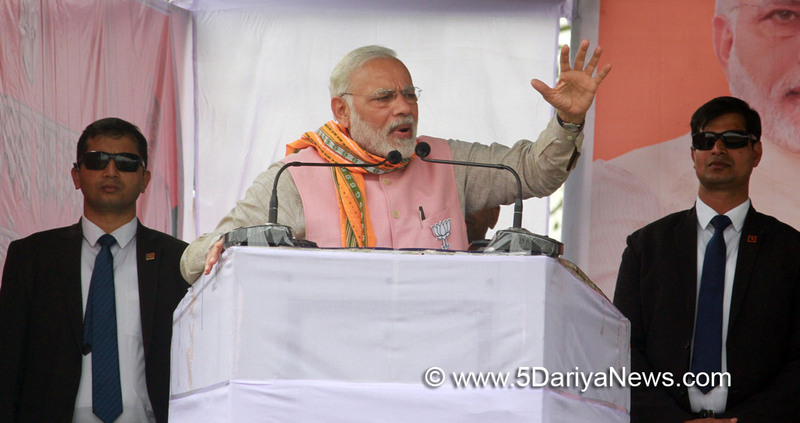 "The BJP government would work on the three cardinal principles of 'Trade, Tourism and Training' to youth which would unlock the gate of self-employment," he said.He also criticised the Left government for "patronising the chit fund organisations and looting people's money"Saying his government was working to develop northeast India, Modi claimed that Tripura remained backward due to 25 years of Left "misrule". "Voting for BJP's lotus symbol will be a punishment for the Left Front government in the February 18 Assembly elections as during its 25 years of misrule people did not get anything, poverty went up and backwardness widened. "He said the previous NDA government led by Atal Vajpayee had set up the Development of North Eastern Region Ministry, and now his government also gave top priority to develop infrastructure of the region and to improve the lives of the people. He mentioned the Rs 1,300 crore National Bamboo Mission had been launched to utilise the huge bamboo resources in the region.Criticizing Chief Minister Manik Sarkar, whose Dhanpur constituency falls in Sonamura, Modi said: "Under his (Sarkar's) white kurta, there is a dark side. His government cheated people by giving poor wages when the people of other parts of the country got higher wages and the government employees got higher salaries. "In the past 25 years, the Left parties hypnotized the people. People could not understand how backward they are. Now the time has come to change the future of the state and the fortune of the people. ""Out of every Rs 100 spent in Tripura, the central government is giving Rs 80. The Manik Sarkar government is unable to spend Central money properly. The Left government is also looting the money of the poor," he said, asking if the Left is allowed to keep ruling, "there will be no development in the state". "People are committing suicide in Tripura. Youths are not getting jobs... The time has come to throw away the Left parties.BJP's national General Secretary Ram Madhav and state president Biplab Kumar Deb also addressed the rallies.